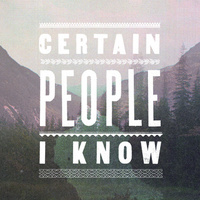 Certain People I Know is the latest project fronted by the legendary Bob Nanna. If you don’t already know this band, perhaps you are familiar with their previous works, which include Braid, Hey Mercedes, The City on Film, and The Bomb. If bands walked a linear path, this band picks up where Hey Mercedes left off, while still bringing their own unique sound to the table. The band is rounded out by Damon Atkinson, Jeff Dean, Lauren LoPiccolo, and Matt Schuessler. Don’t sleep on this band. 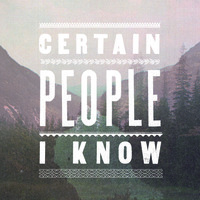 Certain People I Know's self-titled LP is now available on Count Your Lucky Stars via vinyl, CD, and digitally. Certain People I Know "Certain People I Know"